When Disney’s Art of Animation Resort grand opened last week, guests flocked to the Big Blue Pool, one of Walt Disney World’s biggest hotel pools and the centerpiece of the “Finding Nemo” wing. 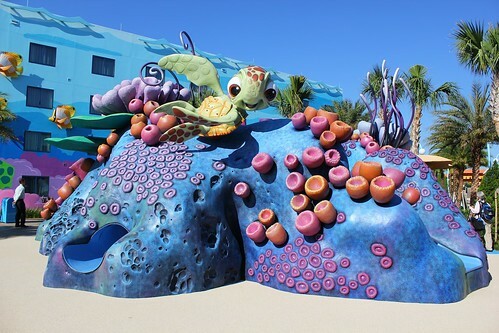 Its larger-than-life characters, colorful decor, and fun features are sure to draw visitors hoping to grab shell and surf the EAC with Crush and the gang. 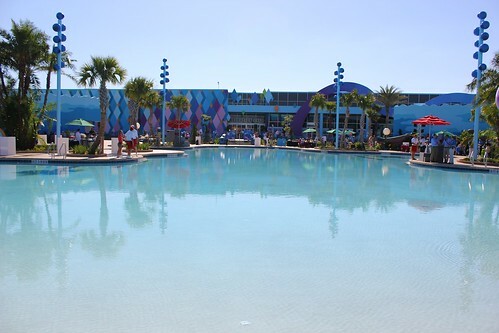 On opening day, May 31, 2012, the first Big Blue Pool Party was held at 3 p.m., featuring a seemingly endless supply of delicious cupcakes, games, dance music, and a special appearance by Mickey Mouse. 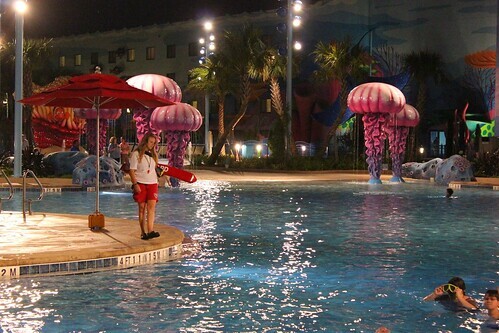 Daily parties and activities take place around the new pool area, but only this special one-time event featured free cupcakes, normally for sale in the hotel’s Landscapes of Flavor food court. Also on hand was general manager Rick Allen, who was excited to finally welcome guests into the hotel. 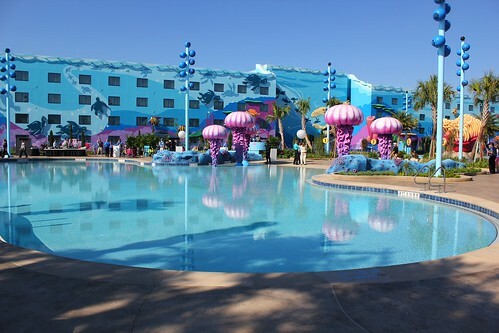 The Big Blue Pool offers an opportunity for guests staying at Disney’s Art of Animation Resort to be “shrunken” to the size of Nemo and swim in his world, encountering all his friends throughout the area. The massive pool features a zero entry walk-in side, varying depths for all levels of swimmers, wet and dry play areas, and one particularly special feature for those diving underwater. 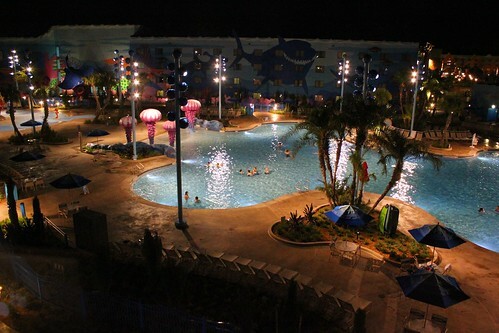 During daytime hours, the decks surrounding the Big Blue Pool are almost constantly filled with the sounds of kids laughing and yelling as they play games and dance with Cast Members. From 8 a.m. – 11 p.m., this isn’t a pool for quiet relaxation but instead a giant play area for kids of all ages. 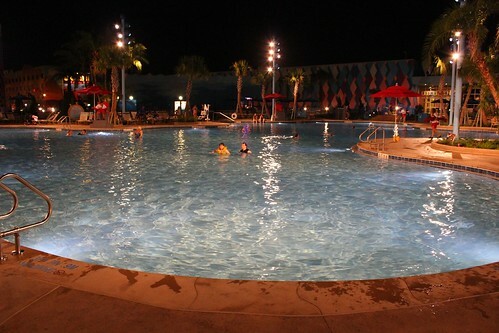 The pool is open 24 hours with the overnight time signaled as “quiet hours,” the only chance for a peaceful swim. But while the areas surrounding the pool are often noisy (perhaps excessively so), the sounds heard underwater in the Big Blue Pool are nothing but enjoyable. 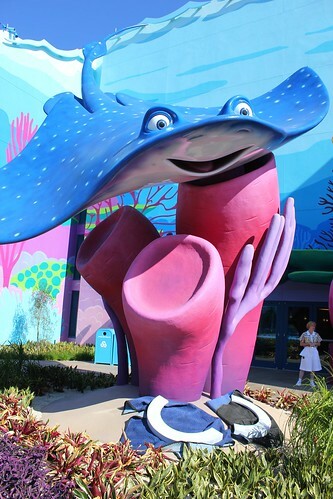 Disney pipes in a combination of upbeat surf and island music with occasional familiar character voices from “Finding Nemo,” including Marlin, Dory, Crush, Squirt, Mr. Ray, and Bruce. Though the music is constant, the voices sound only every once in a while, offering a surprise treat for those swimming through the pool. Take a dip and listen in the video below. It’s worth noting that it took at least 30 minutes to capture the small bit of audio heard here, so it takes quite a bit of commitment for anyone who wants to hear the characters say a lot. It’s a lot easier to just watch the movie – but not nearly as fun. 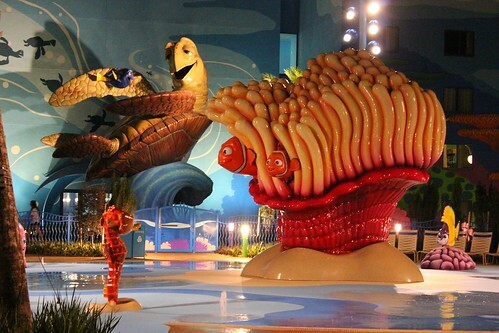 Beyond the Big Blue Pool is a water play area featuring a giant sea anemone with Marlin and Nemo popping out, surrounded by Nemo’s school buddies Pearl, Sheldon, and Tad. 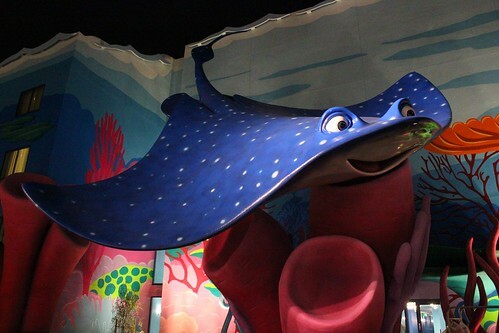 Amidst a larger circular area packed with water jets rising up from the ground, several of these characters also squirt water from their mouths – and yes, Pearl occasionally “inks” too. Even further back, rounding out the area is Squirt’s playground, a dry area where kids can climb stairs and slide down, while running around the padded ground. 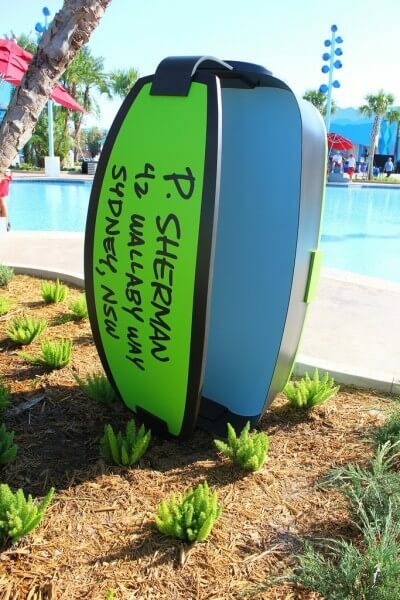 Whether it’s in the Big Blue Pool, near the huge sculptures of Crush and Mr. Ray, or wandering the play areas, the feeling of being shrunken to the size of Nemo is consistent, even down to the giant poolside mask memorably marked on the back with the famous address from the film. Guests staying in the surrounding buildings of the “Finding Nemo” wing at Disney’s Art of Animation Resort can get a spectacular panoramic pool view, particularly from the top floors. Retreating to a family suite is a great way to escape from the sun and the noisy atmosphere around the pool while still enjoying the view below, as seen over the course of a day in the time-lapse video below. Those wanting to call it a night early should be aware that the film is rather loud and that even from a top floor room, the rumbling of the movie could be clearly heard until it wrapped up at around 10:30 p.m. The Big Blue Pool finally becomes quiet from 11 p.m. – 7 a.m., with the area bathed in bright white light, keeping it safe even when lifeguards are off duty. It’s a great time to sit back, relax, or take a stroll with a camera in-hand. 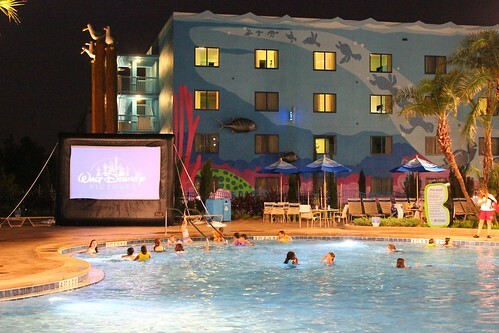 While the Big Blue Pool is a literally huge draw for guests to visit Disney’s Art of Animation Resort, it is intended for guests staying at the hotel (and their friends/family) only. A fence surrounds the entire pool area, requiring the tap of an active hotel key card to enter. 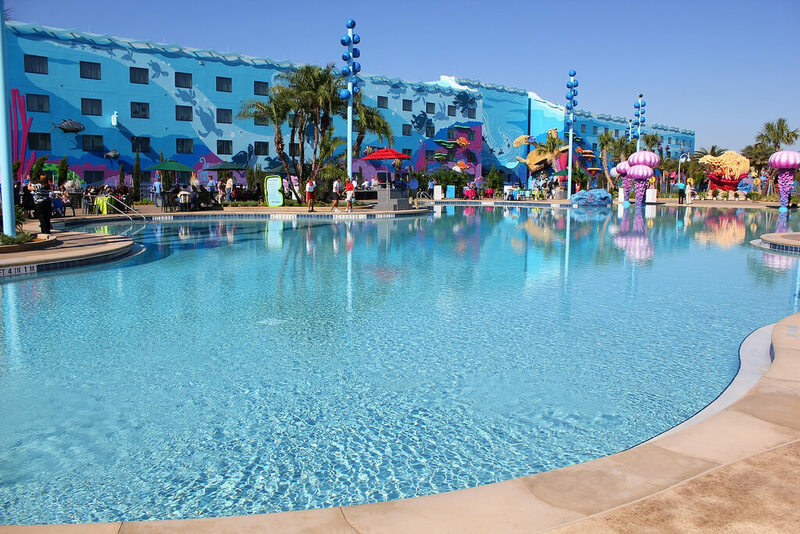 Those paying to stay at Disney’s Art of Animation Resort will certainly enjoy the massive amenity that is the Big Blue Pool and its surrounding play areas. 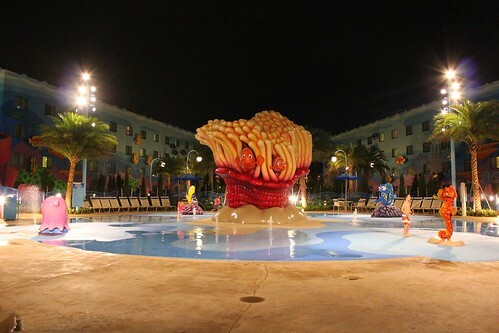 Though the atmosphere can be unnecessarily noisy during the day due to nearly non-stop activities and parties, the pool and decor unite the “Finding Nemo” theme found throughout this first wing to open in the new hotel and the promise of unique underwater audio alone is enough to have fans diving in. This is awesome, duh! I am going to stay for a week there in only nine days!!!!! I can’t wait!! !